Did you know we’re Canada’s exclusive source for LED Casino tables? Choose from our sleek collection of LED glow in the dark casino tables. Roulette, Black Jack, Poker, Craps – you name it! We’ve got it all. Each table can be set to your colour of choice, or to rotating colours! If you’re looking for a more classic look, our standard casino tables are tried-and-true staples. Choose from classic black jack, poker, craps, roulette, and wheel of fortune! The options for a true Las Vegas event are endless. Hart Entertainment provides experienced friendly casino dealers, pit bosses, and croupiers dressed professionally. 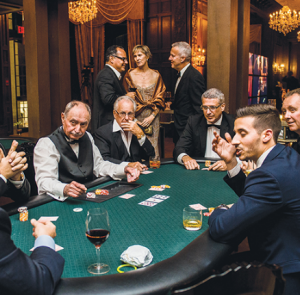 High-quality blackjack and poker tables add an element of authenticity to your event. Our dealers will also teach guests how to make the most of their night. Everyone will have a memorable time! Add a money machine to your event for a surprising element of excitement. This hot trending Las Vegas party rental is a great way to offer top-notch prizes to guests. We offer standard or custom funny money too! Our Toronto money machine rentals are great for grand openings, marketing activations, corporate events, private parties, and charity galas. Contact our party rental professionals today about the Las Vegas event of a lifetime. We will help you plan the perfect Las Vegas night! We would love to hear from you.